What Does Code P200E Mean? OBD II fault code P200E is a generic code that is defined as “P200E Catalyst System Over Temperature Bank 1”, and is set when the PCM (Powertrain Control Module) detects that the catalytic converter on Bank 1 is at a temperature that exceeds the maximum allowable temperature. Note that “Bank 1” refers to the bank of cylinders that contains cylinder #1 on engines with a V-configuration. The purpose of a catalytic converter is to remove harmful exhaust emissions such as hydrocarbons, carbon monoxide, and various nitrous oxides from the exhaust stream by oxidizing these substances when they pass over/through heated catalysts. 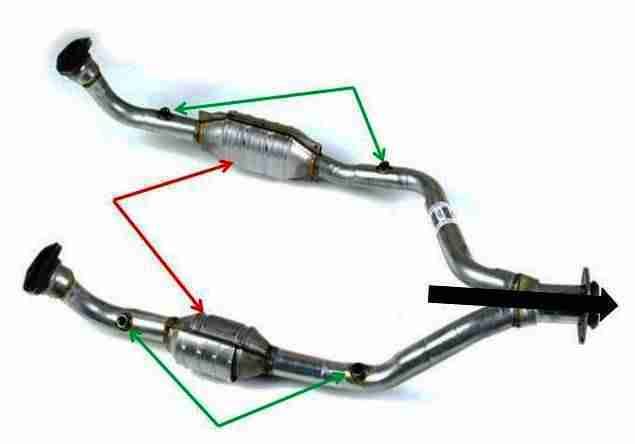 Depending on the type of catalytic converter in use, catalysts can include precious metals like platinum, palladium, and rhodium that are applied in thin layers to a suitable substrate that allows the exhaust stream to pass freely through the converter. Note that during normal operation, catalysts are not consumed in the process of converting harmful exhaust emissions into innocuous substances like oxygen and water. Note though that in order for the conversion process to take place, the core of the converter needs to be at a very specific temperature. Typically, this temperature usually falls in a range from about 4000F (2040C) where it begins to work, to as high as about 1 6000F (8700C) at peak efficiency. However, it must be noted that since factors such as the type and quality of the fuel (diesel/gasoline/alternative fuel(s)) used, type of converter fitted to the application, age of the converter, and the overall mechanical condition of the engine all influence the efficiency of the converter, there is no single effective operating temperature that applies to all catalytic converters under all possible operating conditions. Nonetheless, in a fully functional system, i.e., the engine is in excellent mechanical condition, all fuel trims are within specifications, there are no vacuum and/or exhaust leaks, and there are no other air/fuel metering codes present, there are relatively low concentrations of harmful exhaust emissions present. Typically, modern engines emit only a few tenths of a percent of CO2, and less than about 150 ppm (parts per million) of hydrocarbon molecules (unburned fuel) at steady cruising speeds, and the only times these values are exceeded is when the catalytic converter is warming up towards its effective operating temperature, which is usually less than two minutes or so. While the above describes a fully functional system, there are many possible failures, malfunctions, and defects in modern engine/fuel management systems that can decrease the efficiency of catalytic converters. Therefore, since the efficiency and the temperature of a catalytic converter are directly related, the PCM uses input data from the oxygen or air/fuel ratio sensors, as well as dedicated sensors that measure the temperature of the exhaust stream at various points before and after the converter, to monitor both the efficiency and the effective temperature of each catalytic converter. On some applications, the PCM also uses input data from exhaust backpressure sensors to measure the flow rate of the exhaust stream through the catalytic converter(s). In practice, the PCM compares the switching rates of the upstream and downstream oxygen or air/fuel ratio sensors (which should differ significantly) and if the input data from these sensors are deemed to be too similar, the degree of similarity is interpreted by the PCM as a measure of the catalytic converters’ efficiency. This data is then compared to the actual temperature of the exhaust gas both before and after the catalytic converter, and if the outlet temperature exceeds a predefined upper limit, the PCM will deem the converter to be in an overheated condition, and it will immediately set code P200E and illuminate warning light as a result. Note that in some cases, the PCM may reduce engine power, initiate a fail-safe or limp mode, or even shut off the engine to protect the catalytic converter from further damage when it sets code P200E. On some applications, the PCM may allow the engine to be restarted after the catalytic converter had cooled down sufficiently, while on other applications, the PCM may maintain a no-start condition or limp mode until it recognizes that the underlying cause(s) of code P200E have been resolved. Where is the P200E sensor located? The image above shows the typical location in the exhaust system of a V-type engine. In this image, the catalytic converter for each bank of cylinders is indicated by red arrows, while the green arrows indicate the point at which the upstream and downstream oxygen sensors are fitted into the system. The black arrow indicates the direction of flow through the system. Note the placement of the catalytic converts close to where the system attaches to the exhaust manifold. On most applications this is by design, since the high temperature of the exhaust stream as it exits the manifold assists greatly in reducing the time the catalysts in the converter need to warm up to operating temperature. What are the common causes of code P200E? SPECIAL NOTES: It is important to note that although catalytic converters can and do fail after long use, all other catalytic converters failures can be directly linked to a specific failure, malfunction, or defect in either, or sometimes both the engine and fuel management systems that allow excessive amounts of hydrocarbons and/or other contaminants to enter the exhaust stream. Merely replacing a failed or damaged catalytic converter without addressing the underlying cause(s) of the failure, which are almost invariably indicated by additional codes or by symptoms such as driveability issues will only lead to recurrent, frequent, or premature failures of all replacement converter(s). Note that while catalytic converters carry federally mandated warranties, these warranties are always voided if the failure was caused by unresolved underlying issues such as for example, excessive fuel pressure, high oil consumption, the use of unsuitable engine oil, or unauthorised modifications of the engine/fuel management systems. END OF SPECIAL NOTES. None found. Ask a question about P200e.